I'm gonna pop some tags, only got $20 in my pocket... Okay, so Macklemore may have made shopping secondhand "cool" again, but for me, the owner of a consignment shop and avid secondhand shopper, it's always been a way of life. So why shop consignment? Maybe the question is, why not? I grew up on hand-me-downs, the youngest of four, so getting something NEW was a big deal for me from a young age. But then, enter college and peer pressure to have the latest and coolest and newest trend, and I lost myself for a while in the world of fast fashion and credit cards. I thought it was "right" and "necessary" and just the way everyone did the whole fashion thing. Boy, was I wrong. In my early twenties, I started consigning, and my life changed. It started by me trying to make a little money off of clothes I wasn't wearing anymore, but it evolved into a now insatiable desire to shop secondhand. Part for the thrill of an amazing find at an even more amazing price, and part for the ethics behind it. But mostly, shopping secondhand gives clothing new life. And I like that. A lot. So what are some myths about shopping secondhand? Lies, lies, lies. Boutiques, like Darling, and shops that take clothing on consignment, resale, or by donation have policies in place to enforce the expected condition of these gently worn secondhand items. This is to ensure wearability and condition. And while, sure, it may be that secondhand clothing shops doesn't always have the current season's garment, that doesn't mean the items aren't on trend or can't be edited or altered to be so. Remember, fashion is cyclical, and everything comes back around. And those who turn their noses up to shopping secondhand for the latest season's styles are walking clones. True style comes from creative exploration, and shopping secondhand is a great way to explore that skill! Editing your closet is a skill of maturity and experience! More lies! Shopping secondhand may mean still buying "fast fashion" clothing brands at a more affordable/reduced price. However, your purchase of this item continues its journey. You're not supporting that fast fashion company by buying something secondhand. It's already been produced, it's out in the clothing circulation journey, and by purchasing that secondhand item, what you DO is prevent it from sitting in a landfill somewhere. And that's a good thing. Be your own style guru. Stop letting the fashion industry define how you dress. We're constantly feed trends and the latest fashions, but personal style is just that - personal. Take time to develop it, curate it, edit it, explore it, have fun with it! Shopping secondhand, reusing, repurposing, recycling, (gasp) rewearing clothing is a skill to be respected - because it's not the "norm" of our culture's consumer mindset. Your clothing speaks. Your personal style leaves an impression. What are you saying? Keep the clothing in circulation. Sounds silly, but it's true. Shopping secondhand prevents that piece of clothing from becoming waste. Shopping secondhand gives clothing new life. And out of landfills. Encourage a slow fashion consumer lifestyle. 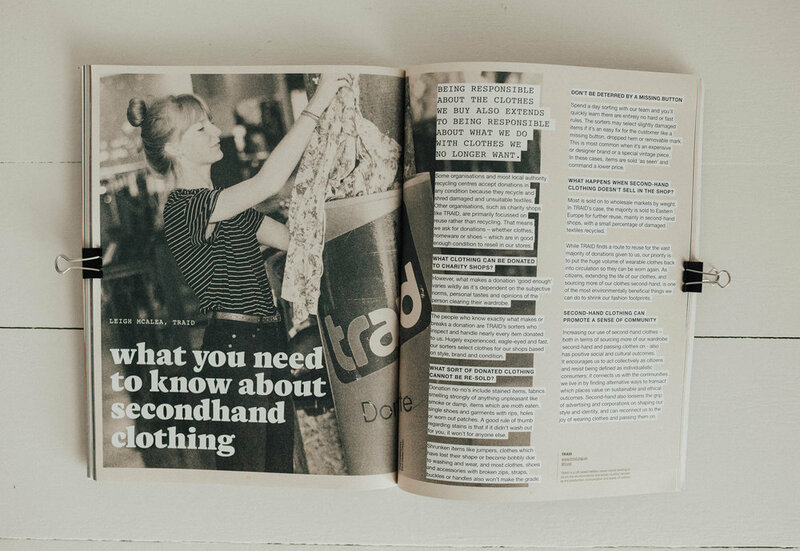 Buying secondhand is a way to practice sustainability in the fashion industry. It's a choice to shrink our footprints, to be conscious of our purchases, and be responsible for the clothes we no longer want. If you need more reasons, they're out there. Or, just stop by Darling or your own local secondhand shops and you'll find out just why shopping secondhand is a lifestyle worth embracing. Fashion Revolution is a global campaign run by the UK based, non-profit organization, Fashion Revolution, to highlight the issues within the fashion industry that we know today. The movement started after the 2013 Rana Plaza garment factory collapse in Bangladesh, where more than 1,134 people were killed and 2,500 injured. Workers had reported signs of cracks in the foundation, and were ordered to report to work anyways. On April 24, 2013, the entire world saw the injustices hiding in the fashion industry - and a revolution began. With fast fashion brands like Zara, H&M, and Walmart manufacturing garments under those roofs, the fashion industry was in the hot seat. Rumored reports of labor conditions could no longer be ignored in the face of devastation. People started to ask for change. Consumers started to ask for change. 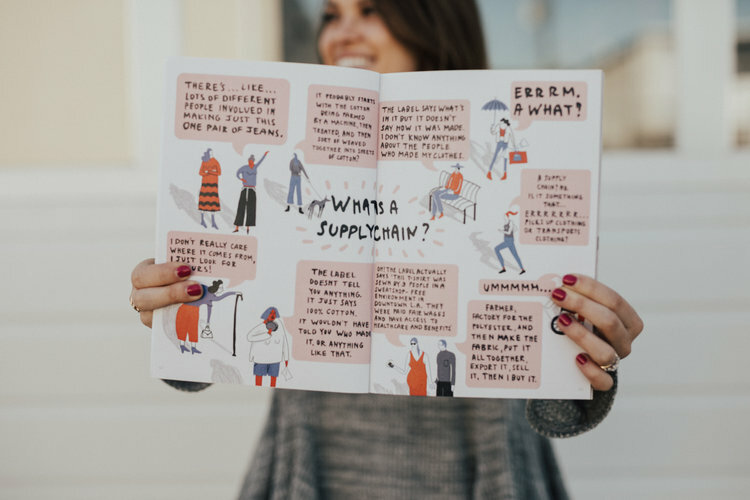 To find out more about Fashion Revolution Week, check out these blog posts by ethical fashion bloggers The Good Wear and Style Wise. Fashion Revolution Week is an annual global event around the anniversary of Rana Plaza, April 24, to raise awareness about the truth behind the clothing industry and the brands we love. The movement is designed to create change and action. It's about building transparency in the fashion industry, and stimulating improvements to current conditions and systems. And it's growing. I encourage you to check out their resources, read about the many issues, educate yourself and challenge yourself, and others, to join the movement. On a personal note, if I truly believe as a human being, fashion consumer, and retail industry business owner that we are to "clothe ourselves in strength and dignity," then this movement could not be more important. Not just for my own wardrobe choices, or the customers at my shop, but for the many, many people working in the fashion manufacturing industry across the globe. It's about them most of all. I may consider myself a novice when it comes to knowledge on the topic, but I've begun my journey in asking the fashion industry "WHY?" And I hope you do, too. After all, it's about social action after education. And the Fashion Revolution has made some clear social ways to for you to get involved. Take a moment to read garment worker stories, available on the Fashion Revolution website. Try a #haulternative, the antidote to fast fashion, by swapping with friends, buying secondhand, or doing a DIY project with what you already have. Write your policy makers and your favorite brands. Learn more here. Read the 2017 Impact Report here. Read the Fashion Revolution blog here. Get posters and other brand assets here. Learn about local events here.